To complement the quality diamonds that we sell, we also sell a range of engagement rings, as well as diamond ear studs. For years, we have been hand-making our rings in our Perth workshop, however, due to demand, we will soon we will begin offering cast engagement rings at a lower price. When buying a ring, most people don’t think twice, nor do they know, about how the ring was manufactured, or how the way it was manufactured affects the quality and other aspects of the ring. The two most popular ways of manufacturing rings nowadays are casting and hand-making the ring. What is Casting and What is Handmade? APECS has an excellent write-up of the full “lost-wax” casting process. Handmade jewellery refers to a bench jeweller, along with a gemstone setter, and sometimes a specialist polisher, collaborating to make a ring or piece of fine jewellery. 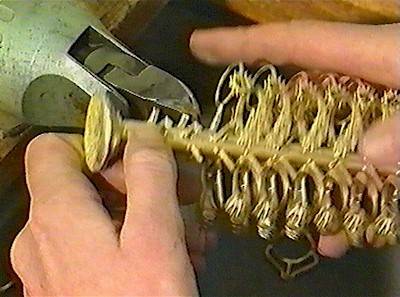 Put very simply, the bench jeweller makes the piece of jewellery by melting down gold and shaping it into whatever shape needed, or by “carving” a small strip of metal. The gemstone setter then sets it and the polisher polishes it. The setter is still needed with a cast ring, but pre-polishing can be done at the casting factory, meaning final polishing will be a lot easier. Cheaper, meaning you may be able to buy a bigger diamond or shoulder diamonds. Cast rings also create a lower price point, meaning for price points of around $1500 are available for a small engagement ring. The ring you see in a catalogue or online will be exactly the same, as casting produces the same ring every time, unlike a handmade ring which is made by a jeweller. 3D CAD models and waxes may be available. This is a lot more life-like than drawings that are usually done in the hand-making process. Modern casting techniques are less porous than ever before, meaning the ring will be stronger. Plus, as part of the modern casting process, the person designing the ring can make changes with a click of a mouse and possibly have a wax printed for you to see. Less metal wastage, especially when there are channel set diamonds. Easy to make modifications during manufacturing process, such as a narrower band or lower setting. Can be made quickly, unlike sending orders to a casting factory which may work on a timetable or be in another city. This is good if you need the ring the next day or next week. You will be getting a unique ring – small “imperfections” or changes are intrinsic to the process of handmaking a ring. Designs are not limited and you can mix metals. For most designs, a two-piece cast allows for different metals for the setting and band, however some designs like this one can not be cast with say a yellow gold band and white gold setting. So, which method is best for you? Well, if you like the idea of a ring that will last for generations, have a unique design or want to alter an existing design, and you don’t mind spending an extra $2-300, then handmade is the way to go. However, if you want something that is cheap, reasonably durable and looks exactly like something in a catalogue, then casting is the way to go. This entry was written by Nikhil Jogia and was posted on on Monday, July 28th, 2008 at 1:36 pm	and is filed under Buying Advice. You can follow any responses to this entry through the RSS 2.0 feed. You can leave a response, or trackback from your own site.